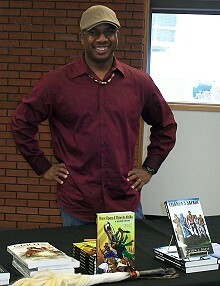 Milton J. Davis is an American author who writes about characters not seen enough in speculative fiction. 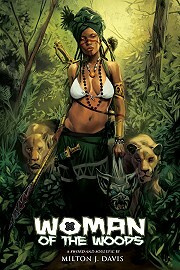 His first book, was, he says, "a homage to African culture, spirituality and tradition". He produced an anthology of SF & F that he called Steamfunk - "African and African American-inspired Steampunk". It has somewhat. There are a few books and stories I probably would not have written if it wasn't for reader feedback. But still, I have to want to write a story for it to happen. There is a particular reader who is very persistent about a certain character in my Changa's Safari series. Because of his enthusiasm I commissioned artwork of the character and I'm seriously thinking about writing a story featuring him. Frank Herbert probably had the earliest influence on my science fiction and fantasy writing. Right now my biggest influence in Charles R. Saunders. Shrimp and grits. I love shrimp and grits. To leave a legacy of positive images and stories about people of African Descent. I love to see the finished product. I get the most satisfaction from a job complete. 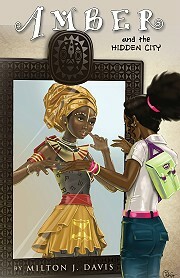 Anthologies edited: Griots, Griots: Sisters of the Spear, Steamfunk!, and The Ki-Khanga Anthology.